Do you have unanswered questions or concerns about your vision or vision care? Your eye care provider is an excellent source of information about your eye health and general vision issues. The next time you visit them, you may want to ask him or her one or more of these questions. How is my eyeglass or contact lens prescription determined? Eye care specialists use three methods to determine your prescription: visual acuity measurement, retinoscopy, and refraction. The visual acuity test measures your ability to see letters clearly on an eye chart located 20 feet away. Retinoscopy involves shining a light in your eye while you look at an eye chart, which gives them a general idea of your prescription. Refraction is used to refine the information obtained through retinoscopy. During the test, you'll look through a phoropter, an instrument that contains many lenses. Your eye care specialist will flip between two different lenses at a time and ask you to identify which lens offers the sharpest vision. If I just need new glasses, why should I have other tests? Updating your prescription is just one part of a comprehensive eye exam. During your visit, you'll also be tested for conditions or diseases that can affect your eyesight, such as glaucoma, visual field deficits, depth perception issues, color blindness, cataracts, diabetic retinopathy, corneal ulcers, macular degeneration, retinal detachment, and optic nerve issues. If any diseases or conditions are detected, your eye care specialist can make treatment recommendations and referrals that will help you protect and preserve your vision. 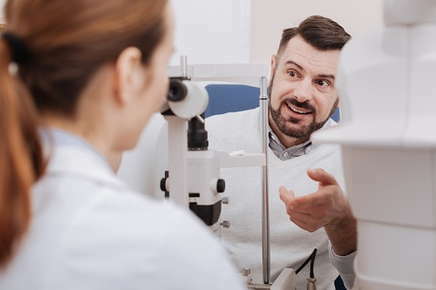 If you've had issues with your eyes in the past or have a family history of diabetes, glaucoma or macular degeneration, you may want to ask your eye care professional how often testing is recommended for you. What are signs of serious vision problems? Why do I need a separate exam for contact lenses? Contact lens exams measure the curvature of your cornea. The exam ensures that the lenses you receive fit comfortably and provide sharp, clear vision. Exams also involve measuring your iris and pupil and testing your tear film. Your contact lenses may quickly become dry and uncomfortable if you don't have an adequate tear film. If dryness is a problem, your optometrist may recommend lenses with a high moisture content to alleviate the problem. Eventually, nearly everyone needs reading glasses to see close objects clearly. The trouble starts when you develop presbyopia, an age-related eye condition that affects the clear, flexible lens located behind your iris. The lens constantly changes its shape to help you focus on objects at various distances. Around age 40, the lens becomes less elastic, which makes it hard to focus on near objects. You can develop presbyopia even if you've never worn glasses before. If you already wear glasses, you may benefit from bifocals, trifocals or progressive lenses. Unlike trifocals and bifocals, progressive lenses are unlined and feature gradual shifts in prescription strength. Do your eyes burn and ache at the end of a long work day? Spending hours in front of a computer screen can lead to eyestrain, headaches, fatigue, irritated eyes, blurred or double vision, and neck and back pain. Computer glasses can help alleviate these symptoms. The glasses filter blue light and are designed to provide clear vision at the optimal distance for viewing your computer screen. Although wearing computer glasses can be helpful, it's also important to take frequent breaks from your computer and other digital devices to reduce eye strain and other uncomfortable symptoms. You probably have a few of your own questions, in addition to these common questions. We welcome your questions and encourage you to make a list of all of the topics you'd like to discuss during your next visit. Call us today to schedule your next appointment. American Academy of Ophthalmology: What is Presbyopia?